There are a few different types of advisors at Cal Poly Pomona. 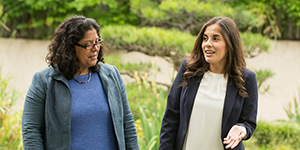 Professional staff advisors are full-time college-based staff. This means that they are typically located in a central area of your college and have broad knowledge of the majors, but they are experts in campus policies, procedures, resources, and class selection. You can find contact information for the professional staff advisors in Student Success Central’s Advising directory. 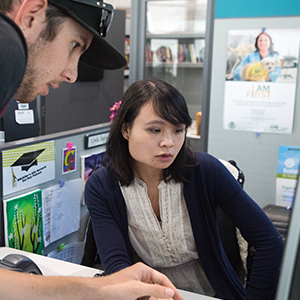 Student Support & Equity Programs helps undeclared students with academic advising. Faculty advisors are experts on their curriculum. They can help you with class selection, but they are also your gateway into your major. They can help you with research and internship opportunities, as well as career options and graduate school. 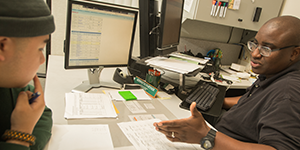 You can find faculty contact information on your department's website. International students can also find information and resources at the International Center. EOP students have access to an EOP academic advisor. If you're a Bronco Athletics student-athlete, you have an advisor that manages your academic support program and monitors your academic progress in relation to NCAA, CCAA and university requirements. Bronco Advising Center (BAC) counselors can answer your questions about your class registration, academic record, financial aid package and account balance. You can also come to the BAC to ask about general advising and the CPP Pledge & California Promise programs. You can find their contact information on the BAC website. The Registrar's Office Transfer & Graduation Advisors (TGAs) can answer questions about transfer coursework, graduation and your Degree Progress Report. You can find their contact information on the Registrar's Office website. Know where the office or center is located -- you can use the Advising directory to find your college's advising center, and the CPP Directory for contact information. Schedule an advising appointment -- some advisors prefer for you to schedule an appointment in advance through email, and some have drop-in hours. Visit your academic department to find your faculty advisor's office hours, or visit your college advising center’s webpage to find out how to best get in contact with a staff advisor. Know what to bring with you -- don't show up to an advising appointment unprepared. If you’re attending an advising session in order to decide what to take next term, you should already have an idea of what courses you might register for. You should also bring a copy of your flowchart and curriculum sheet, and know what requirements you've already completed. Double check your advising center’s webpage for any worksheets you may need to complete before coming in. If you have a lot of questions, you might want to write them down so you don’t forget them. Finally, you always need to know your Bronco ID number in case your advisor needs to look up your academic record. In your conversation with your advisor, they might make adjustments to your plans for the term. After your advising session, make sure to update your MyPlanner with any changes you discussed so you know what to register for. Students who are in either of these graduation programs need to submit a snapshot of their MyPlanner for the upcoming term to be considered for priority registration. For more information, visit the CPP Pledge and California Promise website. Have feedback about the Registration Guide? Tell us here.